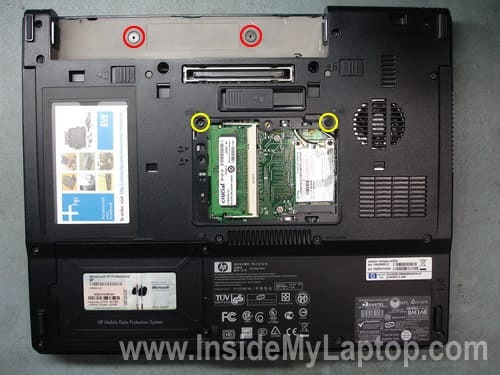 In this guide I explain how to remove and replace the display panel on a HP Compaq nc6320 (nc6300 series) notebook. 1. Replacing the memory module installed in the internal slot. 3. Replacing the cooling fan. 4. Cleaning the heat sink. 5. Replacing the CMOS (RTC) battery. Remove the battery. Under the battery you’ll find two screws (red circles) securing the switch board cover. Remove these screws. Remove the memory cover. Under the memory cover you’ll find two screws securing the keyboard. Remove these screws. 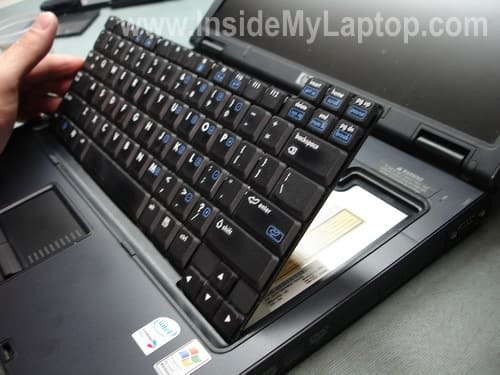 Turn the notebook over and release four latches securing the keyboard. Now you can access and replace the internal memory module. This model can handle up to 2GB RAM total, so you can install up to 1GB RAM module into each slot. You should use PC2-5300 SODIMM RAM. You can remove the cooling fan and clean the heat sink. The CMOS (RTC) battery – a yellow battery on the right side from the processor heatsink. If your computer sets default date and time after each reboot, the CMOS battery is bad and has to be replaced. Simply unplug the old battery from the motherboard and plug in a new one. In order to remove the keyboard, you’ll have to unlock the connector and release the cable first. Very carefully lift up the brown part of the connector about 2 millimeters. The brown part must stay attached to the base. On the picture below you can see the connector in the unlocked state. Now you can pull the cable our of the connector. 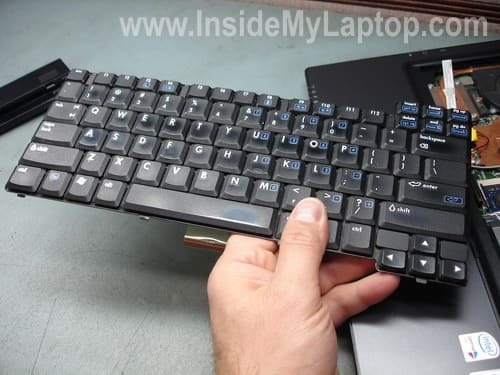 Remove and replace the old keyboard with a new one. Unplug the switch board cable from the motherboard. Lift up the switch board cover with a sharp object and remove it from the top cover. Release the Wi-Fi card antenna cables. Unplug the video cable connector from the motherboard. Remove two screws securing the display hinges. 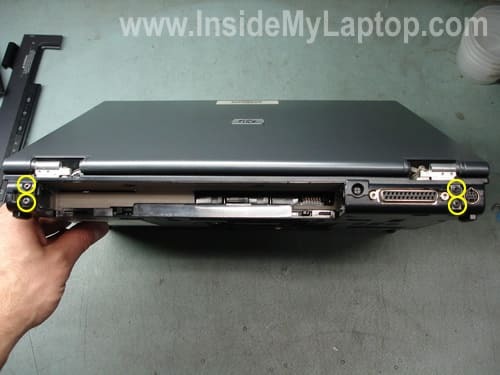 Remove the display panel from the laptop and replace it with a new one if necessary. 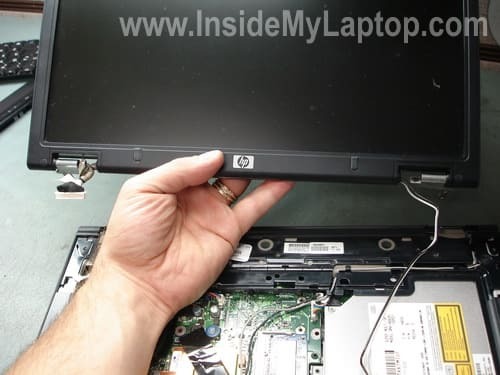 You can find a new display panel using the HP SPS part number witch could be found on a sticker located close the video cable connector. 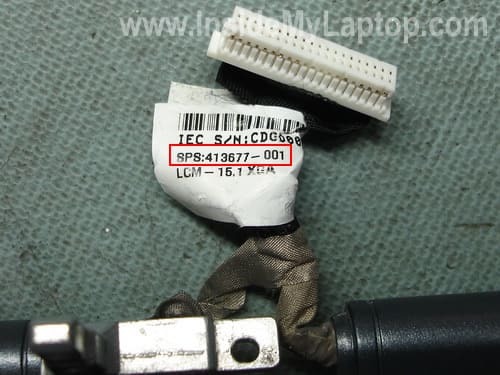 In my case the SPS part number is 413677-001. 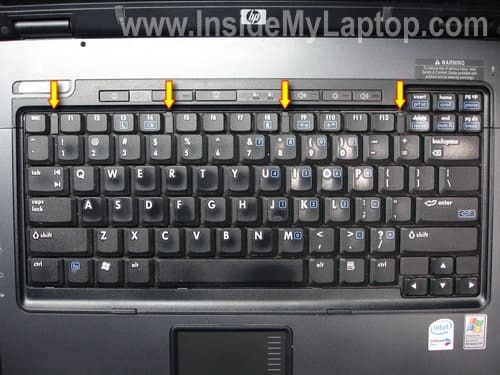 I had a few stuck keys on my laptop but didn’t know how to replace the keyboard. Thank you for the guide. A new keyboard is coming. I’ll replace it myself. Man U Amazing.Thank U very much for Your Guidness.Keep It Up.God Bless U. Awesome guide! You really know what your doing there man! I appreciate it. Thanks a ton! I have an HP zv6000 series laptop. The display cover does not stay in an upright position but the display panel does work. I noticed a small crack in the outside cover where it attaches to the hinge. I can’t seem to find info on your website regarding this issue 1). how do I remove the display cover? 2). where can I get a replacement cover / hinges? 3). Should I have someone else do it? Apparently one or both display hinges are broken. 1). how do I remove the display cover? You can read through the official service manual for Pavilion zv6000 notebook from HP website (it’s a pdf file and might take some time to load). They explain how to replace the whole display assembly. 2). where can I get a replacement cover / hinges? You can find new hinges on eBay for about $25. 3). Should I have someone else do it? I was referred to this site because I purchased new 1GB sticks for my HP Pavillion dv8125nr notebook, and I can’t find the exact configuration explained anywhere…not the HP Manual, which I downloaded, or any other site except those that show me models that don’t have the same setup. I can surmise that the memory modules are beneath a cover, I remove the cover and see two compartments, one is the mini-PCI communications device, and hopefully, the other contains the memory modules. There are two screws which appear to be those that one would loosen to remove this memory shield, but with strong-arming the shield, it won’t come off. I was referred to this site because I purchased new 1GB sticks for my HP Pavillion dv8125nr notebook, and I can’t find the exact configuration explained anywhere…not the HP Manual, which I downloaded, or any other site except those that show me models that don’t have the same setup. I can surmise that the memory modules are beneath a cover, I remove the cover and see two compartments, one is the mini-PCI communications device, and hopefully, the other contains the memory modules. Apparently you downloaded a wrong manual. You’ll find instructions for accessing and removing both memory modules in this maintenance and service guide. You are correct both memory slots can be accessed from the bottom and located close to the Wi-Fi card. Check out the service guide on the page 98. I have a nc6320 that needs the screen replaced. By chance do you know what size torx screwdriver you need to remove the screws under the battery securing the switch board cover? Thanks for the how-to! Came across this site and Glad I did saved me hours on ..trial and error …technics. I’m glad to help. Thank you for your generous donation! Can you please show a photo of the back of the keyboard. I want to know if its worth removing it to clean the keys. You will not be able to access keys from the back of the keyboard. I believe these USB ports are soldered directly to the motherboard. It’s necessary to remove the motherboard, unsolder damaged ports and replace them with new ports. Finding new USB ports could be (and will be) a problem. I doubt that you can find them. Using a USB PCMCIA card could be a good cheap alternative. Thanks, your step by step instructions really helped me to clean my fan, due to dust it was making loud whirring sound, but now the noise is normal. Thanks for posting this instructions. I broke my sons DC connection on his nc6320 laptop, can I buy a docking station to charge it. Instead of replacing the motherboard or the dc connector. Thanks to whoever wrote this article, as it has just saved me heaps of cash and a great deal of time. I had a keyboard that was falling apart and with your help I have replaced it & as you can see it works fine. It is always nice to have nice pics to go along with directions for the imagination impaired. I would like to replace my display with a higher resolution display. Do you happen to know where I can get a direct replacement with a higher resolution? Your site has saved me a hours of trying to replace my nc6320’s LCD panel when I couldn’t find anything on HPs site. You’re a lifesaver. Please keep up the great work. I have referred others to your site. Thanks a million. 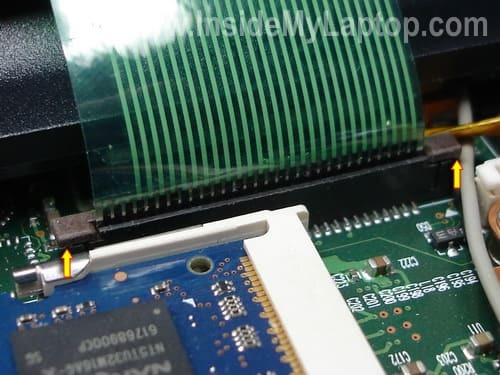 can i change my wga low resolution screen/display assembly for the higher resolution swga display by a simple swap without changing the video card or motherboard? Not sure about that. If you change LCD and video cable, it might work. Thanks, this was exactly what I needed to do. Clear, easy to follow. Spot On! Easy to follow instructions and well illistrated. Thanks. where can i get a display panel for hp pavillion dv4-1028us? You can buy a brand new screen for HP Pavilion dv4-1028us notebook on ebay. 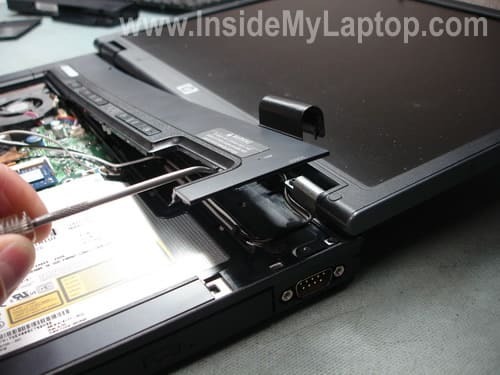 Here’s official service manual for HP Pavilion dv4 notebook. You’ll find screen replacement instruction in the manual on the page 84. By the way, I don’t think it’s necessary to separate the display panel from the laptop base in order to remove and replace the screen. Good day sir, i have an issue here i think you might have the solution. 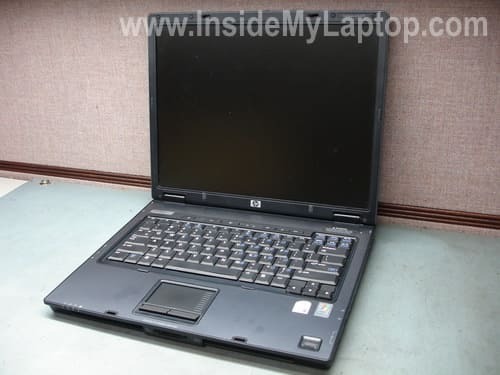 i bought a fairly used hp compaq nc6320 but have not been able to use it. each time i put it in it pisplay power on password and i dont know the password nor the person that used it,what should i do. thanks. I have red your article and it helped me a lot changing the internal ram. Now I was wondering if u could help with another issue. 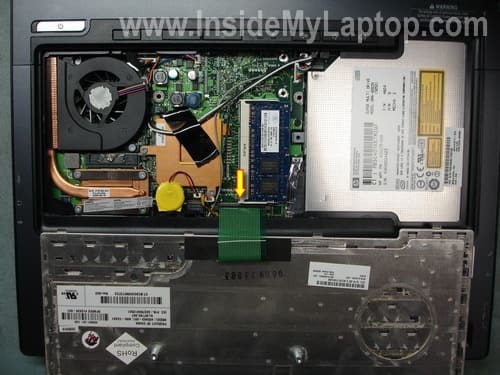 I have a spare processor it is a intel core duo T5600 (1,83 Ghz) and I was wondering if it would be compatible with the actual motherboard which is the one that came from the factory instead of keeping the original T2300. I honeslty prefer to havesome feedback from you before trying it myself risking to damage the pc. If you compare specs for T2300 and T5600. You’ll find that these two are very similar and support same sockets, same FSB. When you go to T2300 specs and click on the Compatible Products link (in the left sidebar), you can see supported chipsets. Confirm that you have one of the mentioned chipsets on your motherboard. 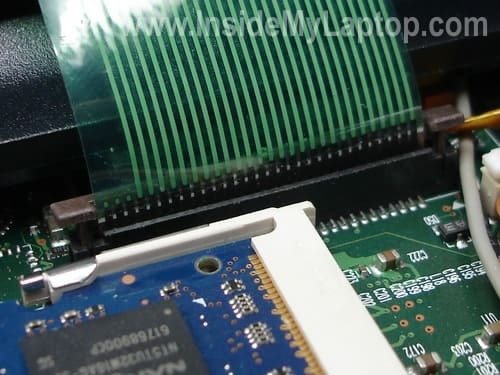 If yes, most likely you can go from T2300 to T5600 processor without any problem. I am going to try right now and let you know! Thanks a lot for looking into that! Done with no probs at all! and the windows assesment going up from 3,8 to 4,8!!! Is it possible to change the VGA also on this laptop? All i Know is that it is fused to the motherboard but can it be done anyway? Unfortunately, you cannot. The graphics card is integrated into the motherboard and cannot be replaced or upgraded. I have a nc6320 and it shows a blck screen and reads Non System Disk or Disk Error. What do I need to do to fix it? i am currently in the middle of changing my screen but i cant seem to remove the wireles leads attached to the screen. Mine see, to go under the mother board by the fan? am i being stupid or is mine be wired wrong? They go under the computer and you can see where they end up if you turn the laptop around and look where Step 1 is you can actually see the black and white wire. i have a Compaq nc6320 labtop and i need to get my graphics card out. I believe in this model the graphics card is integrated into the motherboard. The graphics card cannot be removed, replaced, upgraded. If the graphics card fails, the whole motherboard has to be replaced. Just in case, check your laptop specs again and make sure you have integrated graphics card. My NC6320 screen is constantly distorted and flickering and is aggravated as the screen lid is moved up and down. It started with a vertical line up the screen and got gradually worse. Viewing on an external monitor is however perfect. Is this likely to be a loose connection, a dodgy graphics chip or a problem with the screen itself. Would be grateful for advise before buying any spares. First of all, I don’t think your problem is related to the graphics chip because external video still works fine. 1. Check connection between the video cable and motherboard. Try reconnecting the cable. 2. Check connection between the video cable and LCD screen. Try reconnecting the cable. 3. 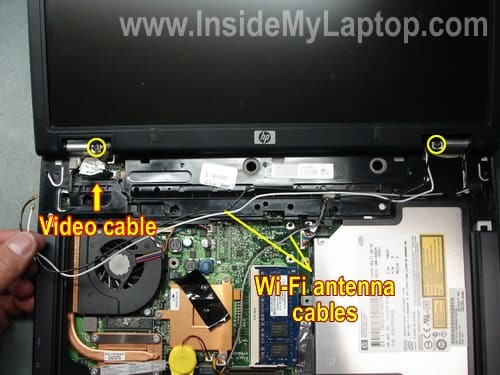 If reconnecting the cable doesn’t help, try moving the video cable while the laptop is turned on. If moving the cable affects image on the screen (it’s getting more garbled, getting more lines, or image clears), most likely there is a problem with the video cable. Try replacing it. 4. If moving the cable doesn’t affect image at all but moving the display back and forth affects it, most likely there is a problem with the LCD screen. Try replacing the screen. 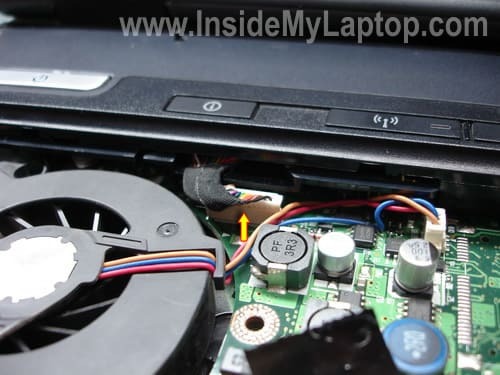 Thanks for ur support, but what can I do 2 my HP COMPAQ nc6320 notebook when I plug it to the charger(power) the laptop comes on without me using the power button, and after a few minutes it will stop charging while the charger is plugged to it, so pls what do I do thanks. Yes, it’s possible but not easy. Thanks for this great how-to ! My display would fade if the lid was moved. Eventually i was able to track it down to a loosly fit video connector. I’m sure that the thing would not have survived if i had tried to find the connector myself! Thanks!! My NC6320 doesn’t switch on any more: it is dead. Battery is OK and transformer/battery charger is ok to. It is possible to change Sound card? available at market? While Using skype there is more noise even format and drivers reinstall, but still continue the problem, but while making a skype call, that time i touch the such external port (Earth Contact) noise will be reduce but not clear..at the same time without earth contact from my hand at laptop there is fully disabled sound (no sound). You cannot change the sound card, it’s built into the motherboard. I’m not sure if your problem is related to the sound card itself or something else is going on with the motherboard. I guess you can try using an external USB audio card. They are cheap and worth trying. Hi iam using dell lattitude 620d. Monitor is not working properly, it displays the black screen, but system works properly. Sometimes when i shake the monitor it works properly. but most of the times it wont works. Pls anyone help to resolve this. What do you mean the system works properly with a black screen? How do you know? Are you running it with an external monitor? on Step3 the second picture there ist a white plug (4 contacts) between the DVD an the memory-module. For what is it an in which order are the cable/color? Sorry, I cannot help here. I don’t have the large copy of the image anymore.